Advisys is sponsoring a webinar on Client Prospecting with Thomas Jefferson’s Associate Dean William Byrnes, the author of the newly released book National Underwriter Sales Essentials: Managing Your Agency. The sponsored webinar is Wednesday April 2 at 8am Pacific, thus you may enroll without cost! “Many young professionals unproductively spin their wheels when it comes to growing their client base,” interjected co-author Robert Bloink. “The online Thomas Jefferson graduate program is competitive because most faculty members like myself brings decades of business experience into the classroom and keep our students eye on the ball – developing their client books. <— fill in for more information about Professor William Byrnes’ financial professionals program! 2nd book released for Sales Essentials Series – Managing Your Agency! National Underwriter Sales Essentials: Managing Your Agency, the second book by Associate Dean William Byrnes in this soft skills series, released March 3rd. On February 10, 2014 National Underwriter released its book Sales Essentials: Prospecting by Associate Dean William Byrnes. “In this new book we cover such topics as How to Clone Your Clients, What`s your Point of Difference?, The ‘Ben Franklin Method’ For Winning People Over, How to Cultivate A Network of Endless Referrals, and Marketing to the Millennials,” said William Byrnes. “I invite my readers to attend a soft skills webinar based upon the book, sponsored by Advisys, where Robert and I will be speaking about obtaining and maintaining clients. Hundreds of professionals attended our March 5 webinar that focused on lead development. April 2 will focus on client cloning, including: asking intriguing questions, C2C qualified introductions, repeating your successful formulae and finally, client crowd sourcing. On Wednesday March 5 (Prof. Robert Bloink) and on Wednesday April 2 (Assoc. Dean William Byrnes) are presenting on 2 soft skills topics about obtaining and maintaining clients. March 5 will focus on lead development (see below). April 2 will focus on client cloning, including: asking intriguing questions, C2C qualified introductions, repeating your successful formulae and finally, client crowd sourcing. Complicated products and financial strategies make the need for intelligent financial guidance more important than ever before. However, providing effective guidance is now more time consuming than ever. You must be both knowledgeable and service oriented to advise clients successfully. Robert is co-author of The National Underwriter Company’s soon to be published book, Sales Essentials: Prospecting, along with William H. Byrnes, Esq., LL.M, CWM. In the past five years, Robert worked to put in force in excess of $2 billion of death benefit for insurance industry producers. His financial products practice incorporates sophisticated wealth transfer techniques as well as counseling institutions about their insurance portfolios. He is a professor of tax for the Graduate Program of International Tax and Financial Services, Thomas Jefferson School of Law. for insurance, tax and financial planning professionals. Phases of relationship building to cultivate a web of clients and referrals. In-person networking: cultivating prospects and referrals through meetings at local events. How to build relationships by adding value to the prospect’s business in the initial stages of the relationship. The importance of focusing on the prospect and leaving detailed discussions of the financial professional’s business goals for later. This 45-minute webinar will be loaded with content and suggestions that can be used immediately with your next customer appointment or prospect. Learn the best practices of today’s top producers and advisors. Create success with a small-time commitment. 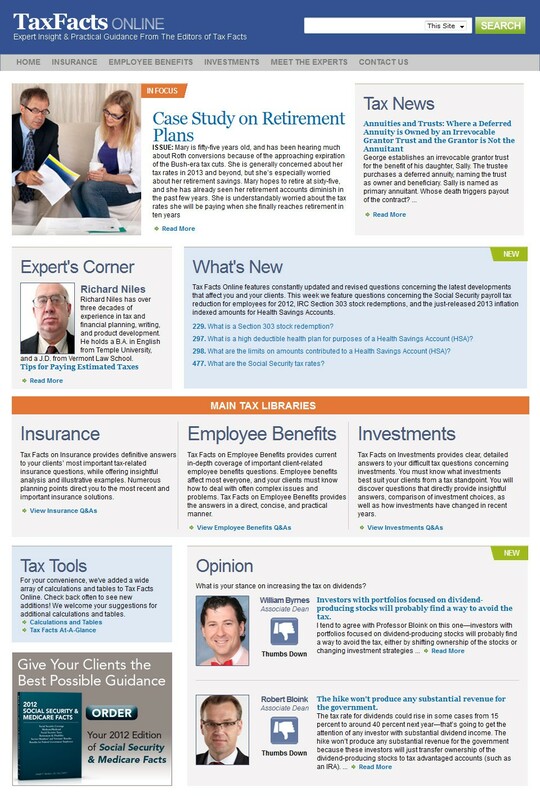 NEW YORK, /PRNewswire/ — In order to aid professionals faced with complicated, confusing tax questions, National Underwriter has released the newest addition to its highly popular Tax Facts library, Tax Facts on Individuals & Small Business, an essential tax reference for financial advisors & planners, insurance professionals, CPAs, attorneys, and other practitioners advising small businesses and individuals. 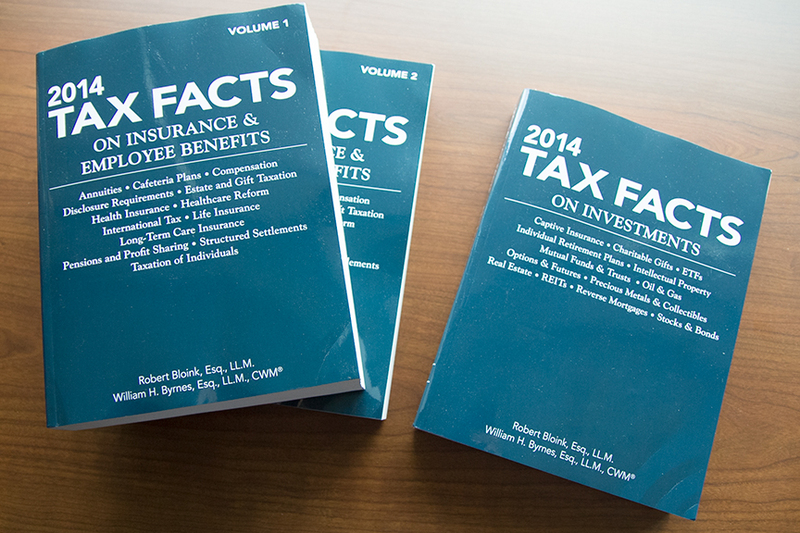 For more than half a century, Tax Facts has been an essential resource designed to meet the real-world tax-guidance needs of professionals in both the insurance and investment industries. For over 110 years, National Underwriter has been the first in line with the targeted tax, insurance, and financial planning information you need to make critical business decisions. With respected resources available in print, online, and in eBook formats, National Underwriter remains at the forefront of the evolving insurance industry, delivering the thorough and easy-to-use resources you rely on for success. National Underwriter is a Summit Professional Network. Summit Professional Networks supports the growth and vitality of the insurance, financial services and legalcommunities by arming professionals with the knowledge and education they need to succeed at every stage of their careers. We provide face-to-face and digital events, websites, mobile sites and apps, online information services, and magazines giving professionals multi-platform access to our critical resources, including Professional Development; Education & Certification; Prospecting & Data Tools; Industry News & Analysis; Reference Tools and Services; and Community Networking Opportunities. Using all of our resources across each community we serve, we deliver measurable ROI for our sponsors through a range of turnkey services, including Research, Content Development, Integrated Media, Creative & Design, and Lead Generation. For more information, go to http://www.summitprofessionalnetworks.com/. NationalUnderwriter.com is celebrating throughout the month of December with two FREE Shipping offers! (No coupon necessary; links provided below.) Also, in preparing for the new year, NationalUnderwriter.com has the book titles for January 2014 that students need! Now through 12/14/2013, shoppers enjoy FREE Shipping on Insurance, Finance, and Legal bookstore purchases of $100 or more at NationalUnderwriter.com! And then, from 12/15/2013 through 12/31/2013, shoppers to enjoy FREE Shipping on any Insurance, Finance, or Legal bookstore purchase at NationalUnderwriter! 1. FREE Shipping on Insurance, Finance & Legal bookstore purchases of $100 or more through 12/14/2013 at NationalUnderwriter – ORDER NOW! 2. FREE Shipping on any Insurance, Finance, or Legal bookstore purchase from 12/15/2013 through 12/31/2013 at NationalUnderwriter – ORDER NOW! 3. “The Tools & Techniques of Investment Planning, 3rd Edition” (SKU: 2730003) IN STOCK at NationalUnderwriter – ORDER NOW! 4. “The Tools & Techniques of Estate Planning for Modern Families” (SKU: 2890000) IN STOCK at NationalUnderwriter – ORDER NOW! 5. “Principles of Estate Planning, First Edition, Updated for 2013” (SKU: 9110001B) IN STOCK at NationalUnderwriter – ORDER NOW! 6. “The Tools & Techniques of Employee Benefit and Retirement Planning, 13th Edition” (SKU: 2710013B) IN STOCK at NationalUnderwriter – ORDER NOW! 7. “The Tools & Techniques of Estate Planning, 16th Edition” (SKU: 2850016B) IN STOCK at NationalUnderwriter – ORDER NOW! 8. “The Tools & Techniques of Life Insurance Planning, 5th edition” (SKU: 2700005B) IN STOCK at NationalUnderwriter – ORDER NOW! 9. “Case Approach to Financial Planning: Bridging the Gap between Theory and Practice, 2nd Ed.” (SKU 7200002B) IN STOCK at Nat’l Underwriter – ORDER NOW! 10. “The Process of Financial Planning: Developing a Financial Plan, 2nd Edition” (SKU: 7190002B) IN STOCK at NationalUnderwriter – ORDER NOW! 11. “The Tools & Techniques of Financial Planning, 10th Edition” (SKU: 2770010B) IN STOCK at NationalUnderwriter – ORDER NOW! 12. The Tools & Techniques of Life Insurance Planning & Risk Management for Financial Planners (SKU: 8080003) IN STOCK at NationalUnderwriter – ORDER NOW! 13. “Income Tax Planning, 3rd Edition” (SKU: 2740003B) IN STOCK at NationalUnderwriter – ORDER NOW! 14. “Tools & Techniques of Risk Management & Insurance” (SKU: 2960000) IN STOCK at NationalUnderwriter – ORDER NOW! FREE SHIPPING on any purchase through 06/30/2013 at NationalUnderwriter – SHOP NOW! Readers stay updated and informed with good ol’ fashioned BOOKS that SHIP FREE this week only, Monday, June 24th – Sunday, June 30th at NationalUnderwriter! 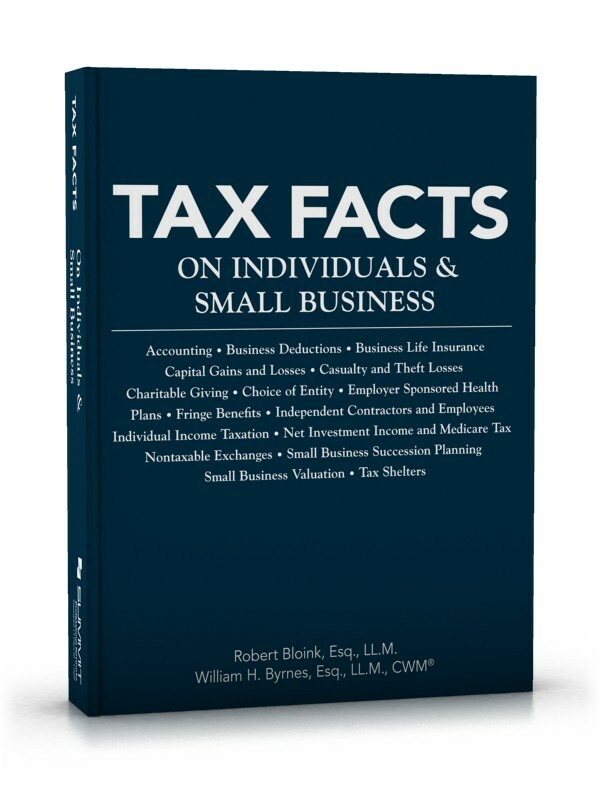 Check out my Tax Facts series (banners on the left and right column of my blog) and for free shipping click below….